Marketing United is currently uniting the smartest minds in the industry to share new ideas on the future of Marketing in Nashville, Tennessee. Rather than promoting services, the event is facilitating a discussion around all the key talking points not only in marketing but MARTech too and how technology is transforming the industry. As a result, it is rapidly becoming the must-attend event for marketers. I have been fortunate to attend the event and soak up the fantastic speaker lineup and hearing some genuinely inspiring brand stories. So far, I have enjoyed keynotes on trending industry topics such as personalization, experiences, storytelling, and artificial intelligence. But make no mistake these are much more than just another round of buzzwords. Kindra Hall hammered home her point perfectly when she pointed out that most people won’t remember who played in the 2014 Super Bowl, but they will remember the commercial with the puppies and the horses. Elsewhere, the importance of online video was summed up perfectly by Arun Chaudhary, who served as the first official White House videographer for President Barack Obama. His words really resonated with me, especially his line “If you don’t constantly tell your story, other people will tell it for you…and take it from you.” Another highlight for me was the growing importance around digital assistants such as Siri, Google, Siri, Alexa, or Cortana. Why? Because we can speak 4 x faster than we can type. 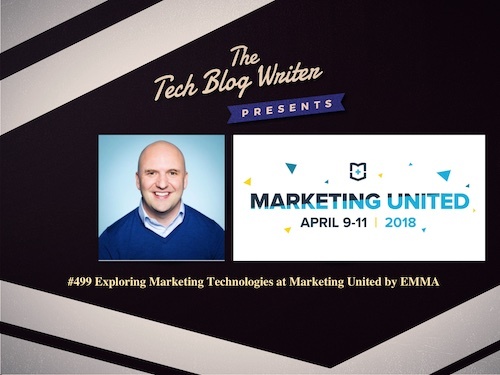 These are just a few of my favorite moments from the event, but in this episode, I talk to SVP Marketing, Colby Cavanaugh about Marketing United by Emma and the key themes at this year’s conference. Colby is an Experienced Senior Vice President Marketing with over 10 years experience in digital marketing. Skilled in Marketing, International Business Development, Customer Relationship Management (CRM), Pricing Strategy, and Management. Strong marketing professional with a Marketing focused MBA from Portland State University – School of Business.